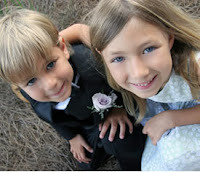 Thinking of including a flower girl in your wedding? Read on for some frequently asked questions! How old is the typical flower girl? Most flower girls are between the ages of 4 and 8, though some brides have opted to choose flower girls who are as young as 2 to participate in their big days. Does the flower girl have to be a relative? No. While most flower girls are related to the bride or groom, it is perfectly acceptable to ask the child of a close friend to be your flower girl. Who chooses the flower girl dress? Typically, the bride decides the attire for flower girls. Does the flower girl dress match the bride’s dress or the bridesmaids’ dresses? Either. Some brides prefer to have their flower girls dressed as miniature versions of themselves; others choose dresses that coordinate with the color scheme of the wedding. Who pays for the flower girl dress? The parents of the flower girl typically pay for the dress. Although, if the bride has chosen a particularly expensive dress, it is preferable that the bride (or bride’s family) pays or the dress. Does the flower girl stand up with the rest of the bridal party during the ceremony? Yes and no. Older flower girls usually stand as part of the bridal party during the ceremony. Younger flower girls usually return to their parents once the procession has been completed. If you choose to have a younger child as your flower girl, it is important to seat the parents near the front. Does the flower girl participate in the reception? Because the flower girl is part of the wedding party, she should be invited to the reception – even if just for a short amount of time. That being said, many brides today are choosing to arrange babysitting services or other children’s activities for their guests who have children. What are some other roles of the flower girl? Older flower girls can assume a greater role in the wedding festivities. They can be in charge of the guest book or can help serve at the reception. Other roles include serving as the lookout while the newlywed couple’s car is being decorated. Can I have more than one flower girl? Yes. It is not uncommon for brides to choose two flower girls. In fact, having two flower girls can sometimes be easier to manage since they can walk together down the aisle. Are flower girls in the wedding photos? Yes. Flower girls also are featured in the wedding party photographs and usually stand just in front of the maid of honor near the bride. Do I have to have a flower girl at all? No. This is your big day – It is up to you! If you are including a flower girl in your wedding, be sure to visit WhereBridesGo.com for a fabulous selection of adorable flower girl baskets, gifts for your flower girls, and cute flower girl t-shirts!